The brain has more than 100 times higher computational capacity than was previously thought, a UCLA team has discovered. Obsoleting neuroscience textbooks, this finding suggests that our brains are both analog and digital computers and could lead to new approaches for treating neurological disorders and developing brain-like computers, according to the researchers. 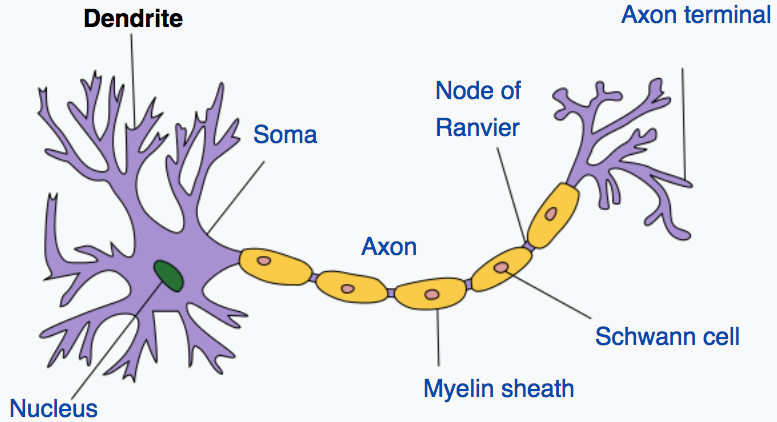 Illustration of neuron and dendrites. 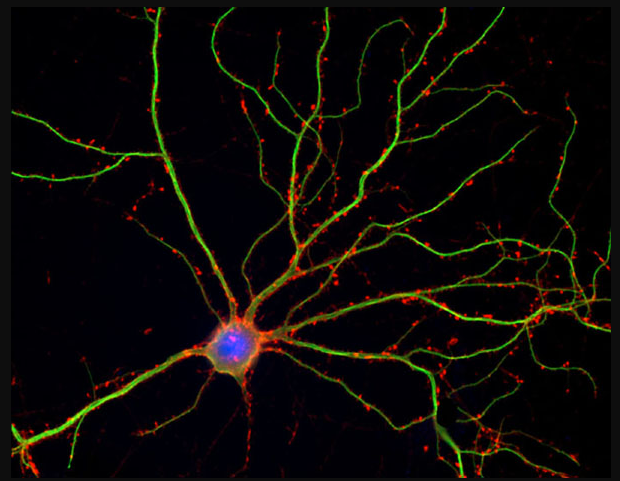 Dendrites receive electrochemical stimulation (via synapses, not shown here) from neurons (not shown here), and propagate that stimulation to the neuron cell body (soma). A neuron sends electrochemical stimulation via an axon to communicate with other neurons via telodendria (purple, right) at the end of the axon and synapses (not shown here). (credit: Quasar/CC). Dendrites have been considered simple passive conduits of signals. But by working with animals that were moving around freely, the UCLA team showed that dendrites are in fact electrically active — generating nearly 10 times more spikes than the soma (neuron cell body). The finding, reported in the March 9 issue of the journal Science, challenges the long-held belief that spikes in the soma are the primary way in which perception, learning and memory formation occur. “This is a major departure from what neuroscientists have believed for about 60 years,” said Mehta, a UCLA professor of physics and astronomy, of neurology and of neurobiology. Because the dendrites are nearly 100 times larger in volume than the neuronal centers, Mehta said, the large number of dendritic spikes taking place could mean that the brain has more than 100 times the computational capacity than was previously thought. Previous studies have been limited to stationary rats, because scientists have found that placing electrodes in the dendrites themselves while the animals were moving actually killed those cells. But the UCLA team developed a new technique that involves placing the electrodes near, rather than in, the dendrites. Using that approach, the scientists measured dendrites’ activity for up to four days in rats that were allowed to move freely within a large maze. Taking measurements from the posterior parietal cortex, the part of the brain that plays a key role in movement planning, the researchers found far more activity in the dendrites than in the somas — approximately five times as many spikes while the rats were sleeping, and up to 10 times as many when they were exploring. Looking at the soma to understand how the brain works has provided a framework for numerous medical and scientific questions — from diagnosing and treating diseases to how to build computers. But, Mehta said, that framework was based on the understanding that the cell body makes the decisions, and that the process is digital. Funding was provided by the University of California. Neural activity in vivo is primarily measured using extracellular somatic spikes, which provide limited information about neural computation. 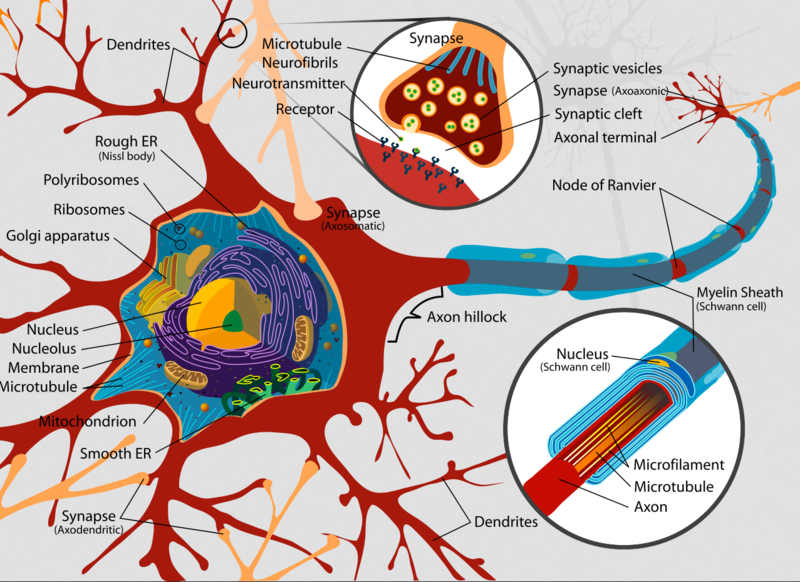 Hence, it is necessary to record from neuronal dendrites, which generate dendritic action potentials (DAP) and profoundly influence neural computation and plasticity. We measured neocortical sub- and suprathreshold dendritic membrane potential (DMP) from putative distal-most dendrites using tetrodes in freely behaving rats over multiple days with a high degree of stability and sub-millisecond temporal resolution. DAP firing rates were several fold larger than somatic rates. DAP rates were modulated by subthreshold DMP fluctuations which were far larger than DAP amplitude, indicting hybrid, analog-digital coding in the dendrites. Parietal DAP and DMP exhibited egocentric spatial maps comparable to pyramidal neurons. These results have important implications for neural coding and plasticity.